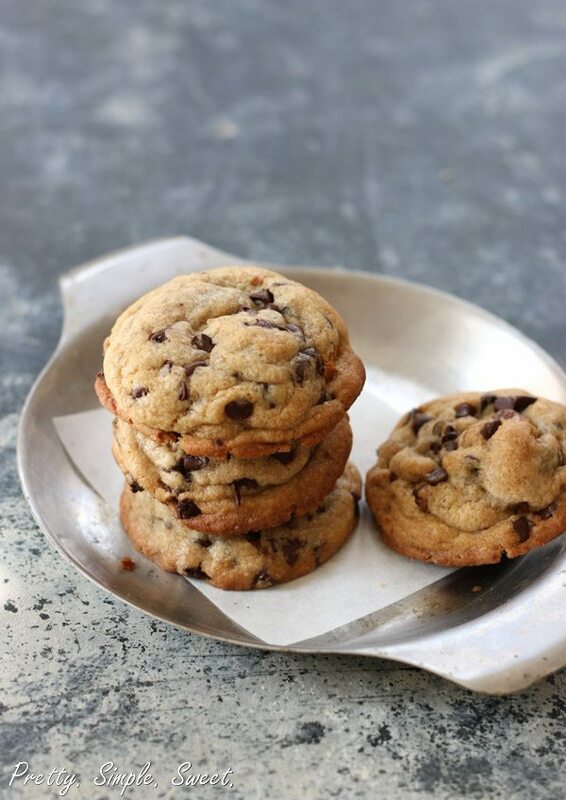 Soft, Chewy and Thick Chocolate Chip Cookies | Pretty. Simple. Sweet. Extremely soft, chewy and thick chocolate chip cookies with a subtle caramel flavor. Warm from the oven and they will melt in your mouth. Oh my goodness. These cookies…. 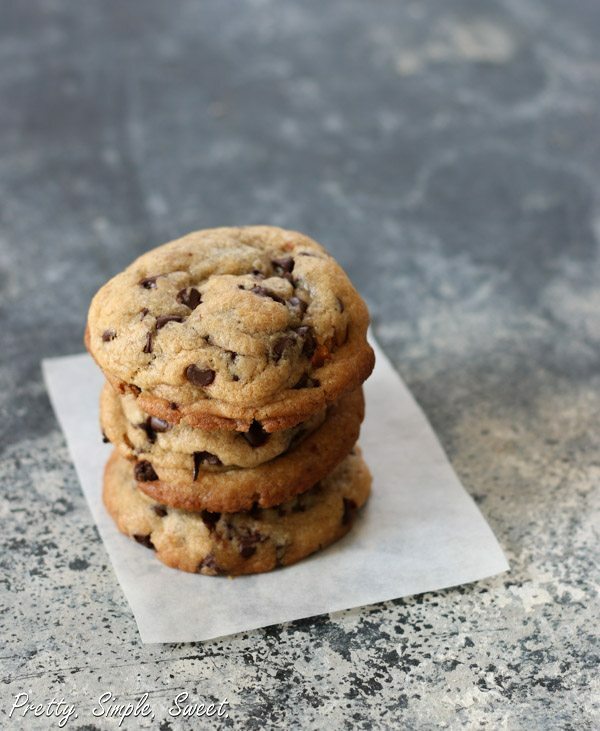 These classic chocolate chip cookies will melt in your mouth, but before I tell you how delicious they are, first things first … let’s start from the beginning. I’ve tried countless cookies recipes, which has led me to a a very important conclusion. I love ALL cookies. 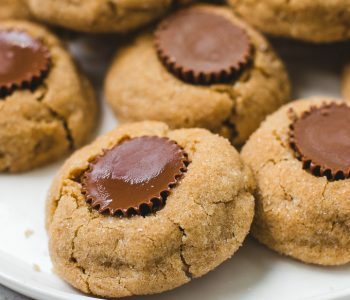 Although I‘ll eat almost every kind of cookie, I still have my idea of the perfect cookie: chewy, thick, and slightly underbaked with a hint of a caramel flavor. Soft Vanilla Pudding Cookies are also my idea of a perfect cookie, but let’s focus on these cookies for now. Where was I? Oh yea … perfection is the right word to describe them I think. They are all the things I mentioned above. They aren’t too sweet either. Try them when they are still warm… To die for! So what make these cookies so soft and chewy? 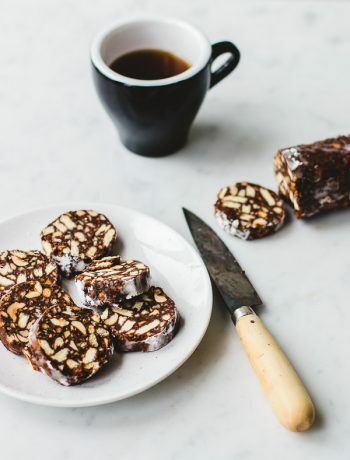 Sugar – Brown sugar adds moistness and therefore increases chewiness. White sugar makes cookies crispier. Therefore using more brown sugar than white sugar make cookies moister, softer, chewier and more flavorful. It is all about the right white-brown sugar balance. Don’t use just brown sugar though, since the cookies will turn out way too moist and soft. Butter – melted butter rather than room temperature increases chewiness. Eggs – instead of using just whole eggs, we add an egg yolk. I know I know. It’s annoying. But trust me – it’s necessary. The egg yolk increases chewiness as well! To make the cookies, melt the butter and wait a few minutes until it’s warm (not hot). Then add the sugars and whisk until well combined. Whisk in the egg, egg yolk and vanilla extract until combined. Add dry ingredients and fold using a wooden spoon or a rubber spatula just until combined. The dough should pull away from the sides of the bowl. Do not overmix – the less you mix, the softer the cookies will be. Overmixing will make cookies tough. 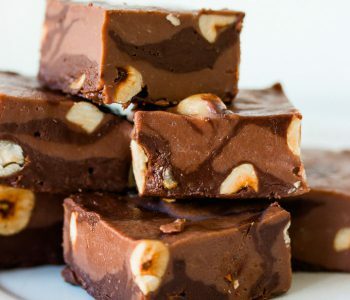 Gently fold in chocolate chips and nuts if using. You may notice once you have finished making the dough, how soft and ‘creamy’ it is. The color is perfect, the texture is perfect and there’s nothing that stands in your way to eat that entire bowl of cookie dough. Now it’s chilling time. It’s not mandatory but I highly recommend it. The dough is so soft at this point that you might end up with flat, spreading cookies. While chilling, the flour absorbs the liquids which therefore leads to thicker, less-spreading cookies. The thing with baking cookies thick is that while the edges get crispy, the center is still underbaked and therefore stays soft. Preferably you should chill the dough overnight. Don’t you like the sound of fresh cookies first thing in the morning? If you can’t wait that long, then chill for a minimum of 2 hours. As for baking time, it took my cookies 11 minutes to be baked perfectly. Start checking to see if they are done after 10 minutes. The edges of the cookies will begin to brown but the center will still look soft and underbaked. That’s how we (I mean I) like it! The longer you bake, the crispier the cookies will be. Underbaking slightly is a secret for cookies softness. Another secret to achieving ultimate cookie softness is cornstarch. In this recipe, I didn’t use it, in order to keep things simple, but I will post another recipe with cornstarch as well, so don’t you worry! Extremely soft, chewy and thick chocolate chip cookies with a subtle caramel flavor. Warm from the oven they will melt in your mouth. In a large bowl, place the melted butter, granulated sugar and brown sugar. Whisk until well combined. Whisk in the egg, egg yolk and vanilla extract. Add flour mixture and mix just until combined. Do not overmix. Fold in chocolate chips and walnuts. Chill the dough for at least 2 hours, preferably 6 hours or overnight (or up to 3 days). Preheat oven to 325F/165C degrees. Line pans with parchment paper. Drop rounded balls of dough onto prepared baking sheet, the size of 3 tablespoons each. 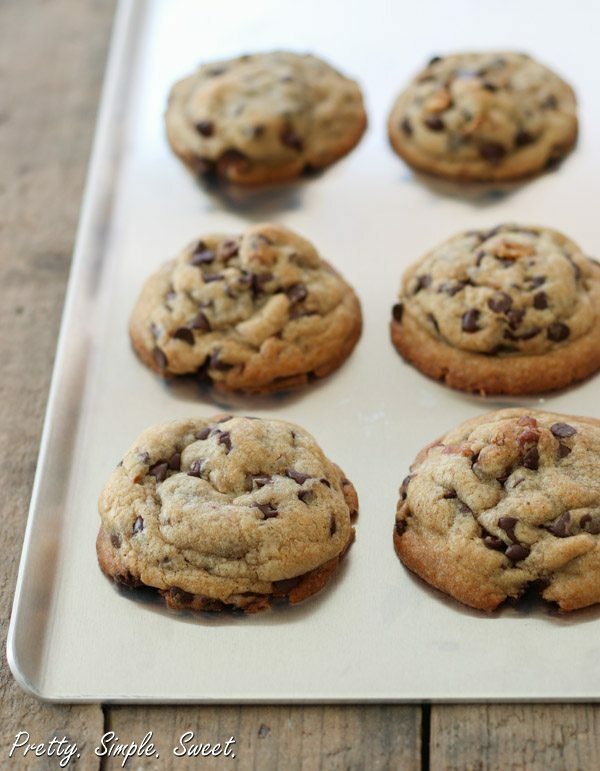 Bake for 10-12 minutes, until cookies just begin to brown at the edges and center is still soft. Cookies will appear undone but will continue to bake on the warm baking sheet. Leave to cool for 10 minutes, then transfer to a wire rack to cool completely. Store cookies in an airtight container for up to 3 days. They can also be frozen for up to 2 months. יאווווווווווווו שירן העוגיות נראות מעולות!! תודה רבה וויני! תפרסמי אצלך את המתכון האהוב עליכם במשפחה 🙂 ואגב, תנסי גם את העוגיות פודינג וניל שמופיעות אצלי בבלוג, הן הכי רכות שיש! 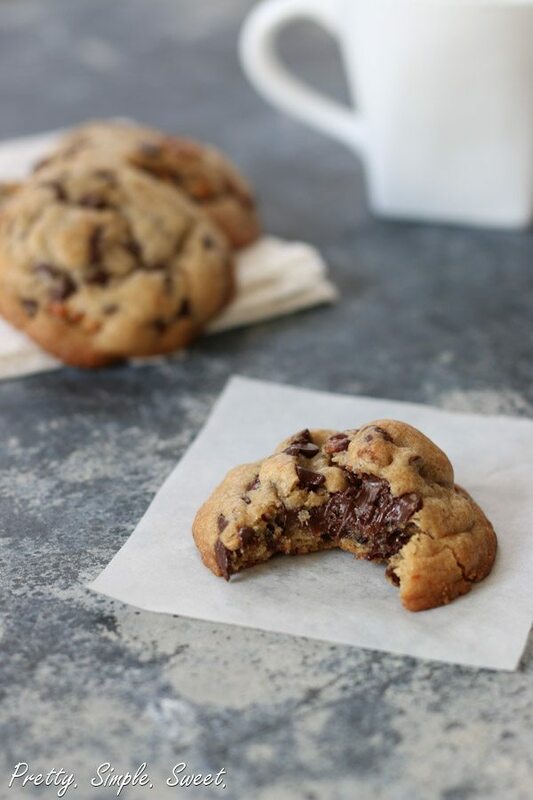 Shiran, these chocolate chip cookies look so great and it definitely looks like you cracked the code to making perfect chocolate chip cookies :). Can’t stop looking at these pics. YUM!! Thank you so much Kathi! I can’t stop looking at your pics too! These cookies look perfect! I can’t get over how amazing all that gooey melting chocolate is. Pinning this! My husband is a cookie purist, he likes chocolate chip and occasionally a snicker noodle, so I’m always trying to find the perfect chocolate chip cookie recipe. Must try this one! Me too, me too…love all the cookies..soft, chewy, crispy, thick or thin. 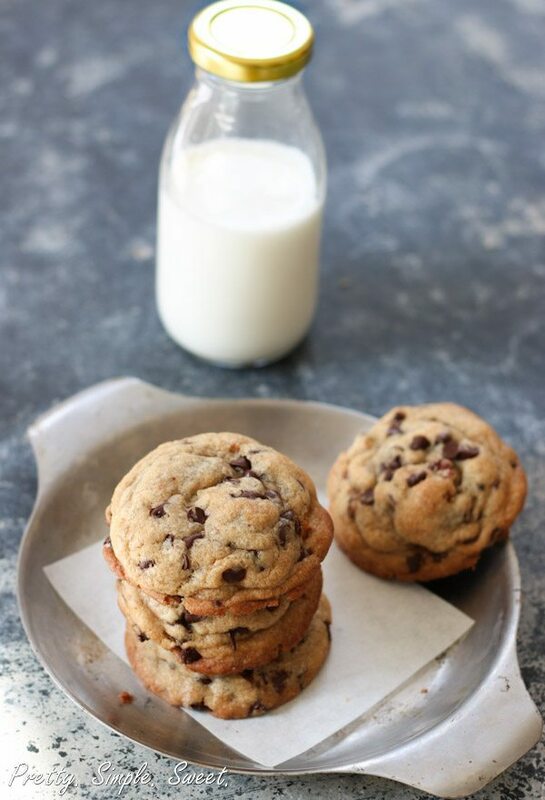 These chocolate chip cookies look fanfreakingtastic! 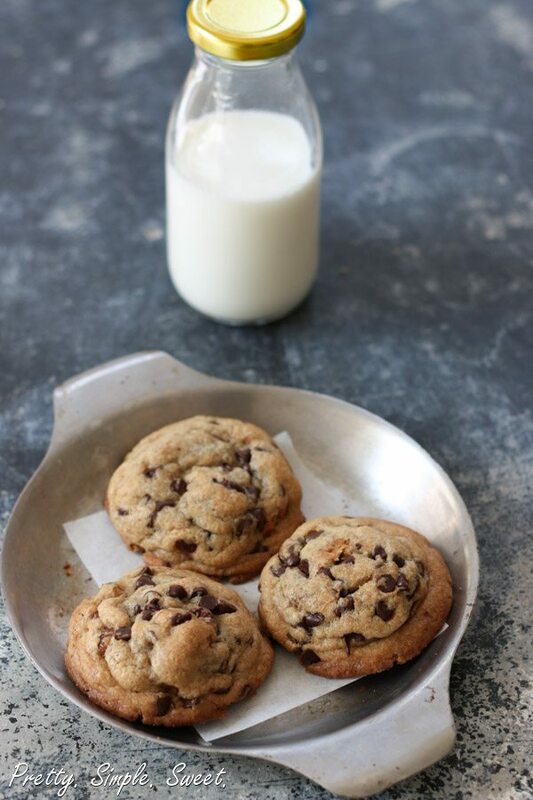 Wow, these do look like the perfect chocolate chip cookie! Beautiful pictures too! Pinning to try soon. Beautiful cookies! Chewy chocolate chip cookies are by far my favorite cookie. I can’t wait to try your recipe. Thanks Loren! You have to try them 🙂 They are super chewy! Got a bowl of freshly made (your recipe ofc 😉 ) cookiedough in the fridge. Cant wait to taste them tomorrow! You’re welcome! Thank you for sharing! I’m sure you’re gonna love them 🙂 They are perfect! I made a batch for friends whilst they were chilling in the sunshine. Really simple and quick to make. I didn’t let the mixture cool and used it straight away. Fantastic results! I changed the final flavourings to cinnamon, cranberry & choc (White, milk & dark) because this is what was in my larder. This is now my go to receipe. Just making up smaller batches the size of biscotti (using half a teaspoon) and they are looking great. Best recipe ever! I made these cookies the other night and they were the best cookies ever! This is a fantastic recipe, easy to follow and spot in. I was out of brown sugar so I used turbinado sugar and it gave it a little something extra because of the crispness of the granules. Will be making these cookies again, thank you! I’m so glad to hear you like them Laura! So sweet of you to write me, thank you 🙂 Next time, try them with the brown sugar, they will melt in your mouth! These cookies are perfect. Thick, soft, and chewy. The best recipe I have found so far. Thank you, I’m glad you think so! They are truly the best! this looks so delicious! can i use this recipe for chocochips cookies icecream sandwich too? would be a difference? Thanks Mariana! I think these would be perfect for ice cream sandwiches, because they are super soft and chewy! Do you have to leave the dough to chill because I seem to be in a rush. 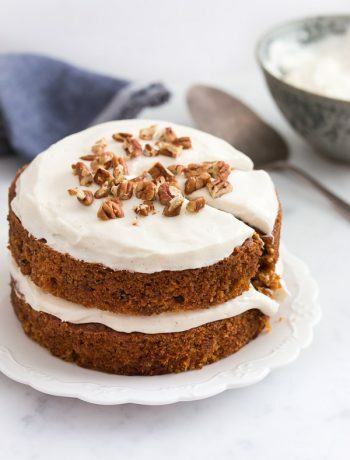 This recipe looks fantastic and I can’t wait to start baking! Hi Kevin, in my recipes it’s always unsalted butter, unless otherwise stated. These are hands down the best chocolate chip cookies I have ever made!!! Rave reviews. Thank you so much! Thank you so much Sue! I’m so glad everyone likes it! First I’d like to say I’ve never commented on a “Google Search Recipe” before. I’ve tried many good recipes l, but nothing that I was head over heals about! I am a cookie freak, like cookies are my comfort food. In the past 5-6 years I’ve made chocolate chip cookies maybe twice, because I was sick of recipes promising this or that from their recipe and ending up a less than par cookie. Last night I came across your recipe and I thought ok what the heck. I made them (added some baking powder) and waited till this morning to bake them. THEY ARE PHENOMENAL!!! Thee best chocolate chip cookies I’ve EVER had homemade or bought from other bakers! These are amazing circles of all things glorious!! So thank you, thank you, thank you! THIS RECIPE is going straight to my favorite recipes!! Hi Erin! Thank you so much for taking the time to write me such a lovely comment! I know how frustrating it is to try recipes that don’t work, so I’m glad you love this one! These cookies are indeed amazing! Did she add baking powder in lieu of the baking soda? I’m guessing that the dough was very soft. I recommend that next time you chill it for a few hours and only then bake, and see if it makes any difference. I always chill them and they turn out super thick. Dear Shiran, my sister and I been looking for the melt in the mouth chocolate cookies and we have decided to tryout yours 🙂 it’s currently sitting in the fridge waiting for be baked! But just out of curiosity, when you stated melted and sugar until well combined, does it mean whisk until the melted butter and sugar combined and its a little sticky? Thanks :)? Hi Shiran. I had been searching for the perfect chocolate chip cookie and came across your recipe some time ago. I’ve been using your recipe with a couple minor tweaks (baking powder instead of soda and room temperature butter) and thanks to you am now the chocolate chip cookie guy among friends and co-workers. They are so popular that a friend asked me to make 200 for his wedding. All that to say thank you for sharing this recipe. They are the best chocolate chip cookies ever! Hi Garrett! Comments like this always make me smile, so thank you so much! 🙂 And making these cookies for a wedding sounds perfect! I have been searching for the perfect chocolate chip cookie recipe for a while. The one I typically use is great but I wish they were a bit thicker. What’s odd is that my recipe is very similar to yours, except for the one egg yolk, and yours also uses a bit more butter. Either way, your cookies look amazing and I’m going to try out the recipe! Thanks for following up, Shiran!! I actually just made two batches of cookies with your recipe, and I’m chilling one batch overnight. Do you do anything special when you put the cookies on the sheet? I find that when I shape the dough into taller mounds instead of just perfect circles, the cookies come out a lot thicker. 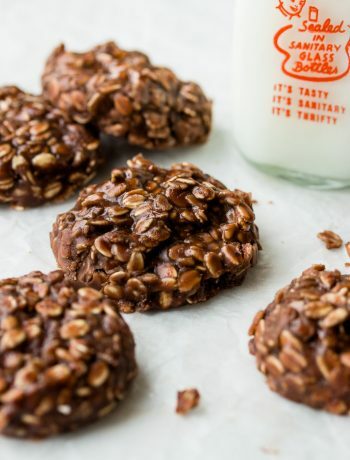 Just wondering if you have any other secrets cause the cookies in the photos on this post look amazing, but mine don’t look nearly that good! I’m glad I can help, Cassie 🙂 The chilling should definitely help! I also shape the dough into taller mounds as you suggested – this would help, too, so do that. 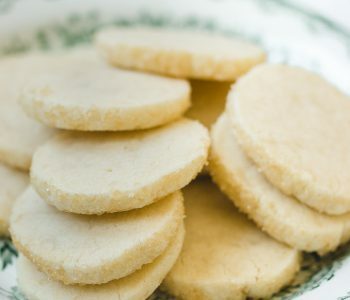 Another thing you can do is to freeze the cookie sheet after shaping the cookies and placing them on it, and bake straight from the freezer (you might need to add 1-2 minutes to the baking time). As the cookies bake, the cold dough takes longer to melt than if it was in room temperature, resulting in cookies that spread less (although I didn’t freeze the cookies you see in those photos). Chilling the dough overnight did make a huge difference. With this cookie dough I didn’t even need to make taller mounds of the dough, they still came out super thick! Thank you for all of the tips. I hope you have a great holiday season! I’m glad it worked out! That’s really the secret. I think that frozen cookies would make a great gift! Just make sure to wrap each cookie individually so they won’t stick to each other. Have a great holiday, Cassie! I used hash infused butter for these cookies and oh my god were they wonderful. Best cookies I have ever made ! That’s so great to hear! Thank you so much, Mariana! I’ve baked these before and they are by far the best cookies ever. My question today is…. 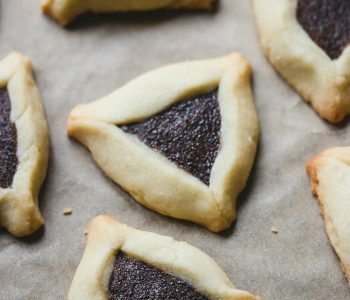 is it possible to bake them without the parchment paper? I’m 9 months pregnant and don’t have any at the moment. Wanted to bake these for the nurses at the hospital. 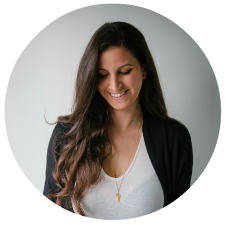 Hi Shiran, thank you for sharing the recipe. It is my 1st time making cookies and it really tastes so well that my daughters are all so happy when they eat. Thank you so much Angeline! Hi! I will add the nuts prior or after the chilling of the cookie dough? Before chilling the dough, along with the chocolate chips. Hi Shiran! Thanks for the recipe and for the response. Will do it with nuts next time. I finally found my kind of cookie for real! So addicting to eat! I chilled mine for 12 hours. ? Hi! Can I chilled the dough up to how many days? Thank you. You can place the dough in the fridge for 3 days. Can i freeze it for a month? Just made these! Subbed self rising for the flour/salt/baking powder; everything else was done closely to the recipe.. except I chilled the dough in the freezer for about 5 minutes and my oven took 5 minutes longer to finish them. Perfect, amazing, soft & chewy cookies! Thank you for the awesome recipe! 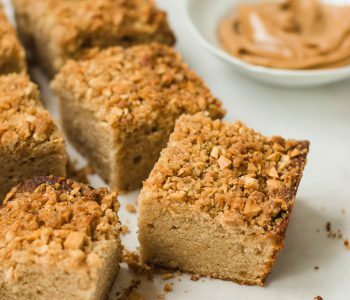 Hi, I fell in love with this recipe when they came out thick and soft. And i always use this recipe but lately it is turning out thin and flat. I’m using the same stuff, following the recipe the same way. I let it chill for 7 hours today and still thin and flat. They are too done to be done or too gooey and uncooked if I take them out early enough. Any ideas? God, the sweetness of these cookies are incredible! So delicious, soft and chewy. The smell that was filling the kitchen while baking was just amazing. While it was in the fridge, everyone took a bite (or maybe even more than one) from the cookie dough, as it already looked really delicious in the uncooked form. This is by far the best chocolate chip cookies I’ve ever made. Me and my husband couldn’t stop eating them. Thank you for sharing this recipe. Thank you so much Cecile! Unfortunately the eggs are necessary for the success of this recipe. Just made this cookies with my young son we both enjoyed making them and eating them. They are delicious and turn out exactly like you said they would. They are by far the best I have ever made finally found a recipe that does what it says thank you! Thank you so much Beki! Can I use my electric mixer instead of mixing by hand ? will this alter the results ? Hi Jamie, there’s no need to use a mixer for this recipe. Everything is mixed by hand. i forgot to sift the flour and used the egg including the whites, will it make the cookies hard? Don’t worry, they would still be delicious, just make sure you don’t overbake them. I have followed this recipe a few times and it always yields incredible results! This is my new “go to” and it doesn’t disappoint. I would love to freeze the remainder because I don’t bake an entire batch. Do you have any advice on adjusting the baking time if I bake them from frozen cookie balls? Hi Anar! I usually add 1-2 minutes to the original baking time, so you can start with that and see how it works. There’s no need to thaw the dough before baking. Hi Shiran, Wow they look so good! I am thinking of making these for my daughters birthday for her to take to school for her class. The kids are 2 and 3 years old so I wanted smaller cookies. How many tablespoons of mixture should I use for a smaller cookie and the cooking time please. Hi Jazel, you can make them any size you want. If you want mini cookies, use 1 teaspoon. I don’t know the exact baking time without testing, but bake them until the edges are lightly browned. It can take 6-8 minutes, or longer if you make them bigger. Just curious! Why 325 for these ones? My dough is in the fridge now! Update- These are nice and thick but mine look very shiny/greasy. Any idea why? I weighed out ingredients. Hi Robin, it’s hard for me to tell exactly what went wrong, especially if you weighed out the ingredients. It could be the mixing, make sure you mix the ingredients in the right order, until fully combined. Also, when the cookies are undercooked, it can cause the center of the cookies to look a little shiny. Thank you so much, Anete! I don’t know what I did wrong but I followed the recipe to the T and did not over mix and they came out flat and greasy. I even put the dough in the refrigerator for several hours prior to baking. It is very discouraging because I never seem to get thick chewy cookies. I was hoping this recipe would have been the one. I understand the feeling, but don’t be discouraged! These cookies may look a bit greasy and that’s ok. It means that they are under baked and soft and buttery and that’s a good thing, but do make sure you mix the ingredients well. Next time, place the cookie dough in the fridge for 24 hours, and then shape it into tall mounds rather than balls. Also preheat the oven. Another trick is to freeze the cookie dough balls until firm, and bake straight from the freezer, but usually what works for me is just refrigerating them for a day. Oh my gosh Elaine, I just made them and they are just like in the picture. Please try again! They are SO WORTH IT!! Hi! If I wanted them to be extra soft how much cornstarch would I add? Hi Samantha, I usually add about 2 teaspoons of cornstarch. I made them and they came out amazing! Is there a way to turn this recipe into a chocolate dough so I can make double chocolate chip cookies? Hi Samantha, I haven’t tried it with this specific dough, but you can try my chocolate cookies recipe. I made them and they came out great but were very gooey and undercooked in the middle. Should I raise the temp of my oven or bake them longer? Also, can I add cocoa powder to this dough to make it into a chocolate cookie? And can I use this dough as a base and change up my add ins like white chocolate chips and cranberries? Thanks! Every oven is different and it sounds like you just need to bake it for longer. Instead of baking the whole batch of cookies next time, bake 1-2 cookies for longer to test it, until you like the result. If I could give these a 10 star I would. Followed the recipe except that I made mine about half the size. Hi, this cookies are perfection!! Just one question, what kind of butter did you use, salted or unsalted. I’ve been using unsalted, but wanted to know if it makes a difference? Thank you!! Hi Yasmin, I always use unsalted butter unless otherwise stated. This recipe is really really good. I must have skipped around because I didn’t notice I was supposed to let the dough chill for 6 hours and I wanted cookies immediately! I ended up freezing the dough for 20 minutes wrapped in parchment paper and I cooked just a few for the first batch following your instructions. My oven is either cooler than yours or the chilling really makes a difference, but I increased the temperature to 350 and cooked for 12-14 minutes, finished for 10 minutes out of the oven on the pan like you recommend, and ended up with really amazing cookies. Thanks for posting this! Best chocolate chip cookie ever! Just Made my 3rd batch for Christmas. Years & years I made the recipe on back of Nestle…never again. Your cookie recipe is the best! Definitely leave the dough chill. Thank you! I’m so glad, thank you Theresa! What adjustments would I need to make for high altitude? 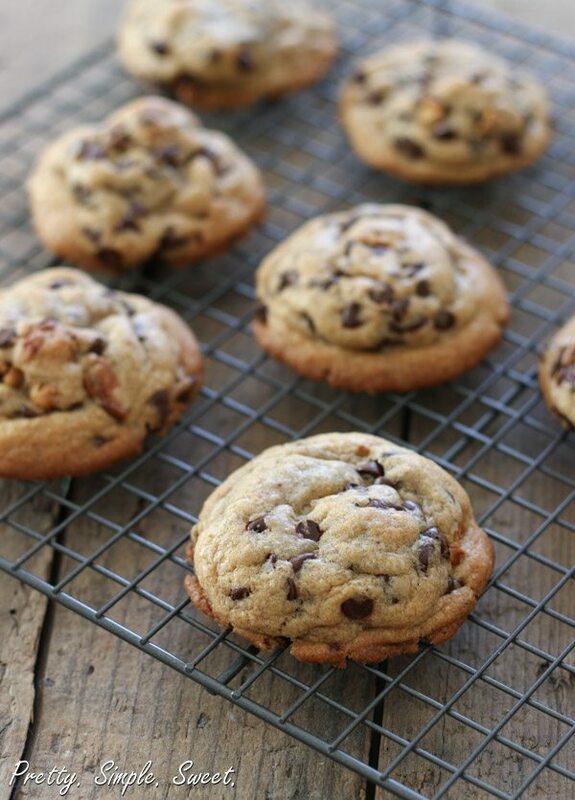 Favorite chocolate chip recipe! Easy, delicious, whole family loved them! We moved to 5300 feet and have been having problems with cookies spreading. So on this snowy day I decided to do research and chose your recipe to try. I did rrefridgerate for 6 hours. I had to cook them a little longer, 14-16 minutes and I used 1/2 cup milk chocolate chips, 1/2 cup semi sweet chocolate chip, and 1/4 bitter sweet chocolate chip. They turned out like I wanted them too. I would be proud to give them out. I will definitely keep this recipe around. I can’t wait to try the chocolate chip cookie recipe with cornstarch but I couldn’t find it on your site. Did you post one? Thank you! You can add 2 teaspoons of cornstarch to the recipe, and mix it with the flour/dry ingredients. Hi these can be frozen but do you need to defrost before cooking please,by the way I made these on Monday wow they were amazing thank you for posting. If you freeze the cookie dough, there’s no need to defrost before baking. The baking time will take 1-2 minutes longer.